Affordable Housing Finance ranked Taft-Mills Group 44 in its list of the Top 50 Affordable Housing Developers of 2018. Taft-Mills Group has been ranked as one of the Top 50 Affordable Housing Developers of 2018 by Affordable Housing Finance. TMG nearly nearly doubled the number of new units it received funding for in 2018 compared with the prior year and hopes to again double production in 2019. This marks the first time the burgeoning company has appeared on the list. Taft Family Ventures has expanded its Raleigh footprint with the purchase of the Owens Roofing Co. property across from the Red Hat Amphitheater in the downtown Warehouse District for $5.1 million. TFV’s Taft Development Group recently bought the nearly one-acre site at 301 West Cabarrus Street and plans to bring a new residential and retail building in that space. Taft Family Ventures announced it is building a 12-unit townhouse development on property bordered by Reade Circle, Dickinson Avenue and Evans Street. Taft Family Ventures is pursuing a third housing development that is geared towards home buyers in downtown Greenville, a company spokesman announced at Wednesday’s annual Uptown Greenville State of the District event. Unlike its previous two student housing projects in the district, Avenue Townes will be 12 for-sale townhomes. The development will be located on a lot that is bordered by Reade Circle, Dickinson Avenue and Evans Street. “Greenville needs diversified housing in our downtown area. A for-sale product is very important to us,” said Mike McCarty, president of Taft Development Group. McCarty described the site as a premiere location since it puts future homeowners within walking distance of restaurants, retail shops, the State Theatre, Sheppard Memorial Library and other amenities. “Hopefully we want to inspire other developers to do more for-sale products downtown,” McCarty said. The firm is finalizing the project’s cost, but McCarty described the structures as “brownstone-inspired, luxury” townhomes. The units will range from 2,160 to 2,400 square feet and are expected to have three bedrooms. Some units will have rooftop decks, elevator access from the ground floor, cantilevered patios off the main living area and parking. Pre-sales will begin this spring. McCarty also announced the company also plans to move its headquarters to a building it is renovating near the intersection of Eighth Street and Dickinson Avenue this fall. Taft-Mills Group, an affiliate of Greenville firm Taft Family Ventures, is launching another affordable apartment project in southeast Raleigh. A family-owned real estate company based in Greenville is expanding its Raleigh footprint with plans for a 180-unit affordable apartment complex southeast of downtown Raleigh. Taft Family Ventures is planning to build the development on a 14-acre parcel at the intersection of I-40 and Rock Quarry Road, behind a Food Lion-anchored shopping center. The project is being built using tax-exempt bond financing and a $2.3 million contribution from the city of Raleigh, says Dustin Mills, President of Taft-Mills Group. The group is an arm of Taft Family Ventures that focuses on affordable housing. Residents who earn 60 percent of the area’s median income will qualify to live there. Mills expects construction to begin in a year and says the project's location is what led the firm to make the investment. Taft Family Ventures has primarily focused on multifamily development across North Carolina, but has more recently diversified into other types of real estate investment. In the Triangle, the firm has been active with new construction on apartment projects from Clayton to Durham, including affordable and high-end projects. In Raleigh, the company built and sold the 401 Oberlin apartment and retail building across from Cameron Village, closing a deal in 2015 for $65 million. “We’re proud to have been involved with projects like 401 Oberlin, but developing and delivering affordable housing is just as important to us as any other asset class,” Mills says. The 112,000-square-foot industrial building provides distribution, storage and office space for Cone Health. An in-state, family-owned real estate company making efforts to diversify its holdings has purchased a Triad industrial building used by a regional health care delivery system. Taft Family Ventures of Greenville paid $6.44 million for a 112,000-square-foot building on 8.1 acres at 2100 Summit Ave. in northeast Greensboro that Cone Health leases and uses for distribution, storage and office space. The facility was built in 1974. Seller South Atlantic Warehouse bought the facility in March 2016 and installed new HVAC systems, lighting, racking, fencing and security systems. Tom Taft, principal at TFV, told Triad Business Journal that the building is in good shape, and that no major changes or renovations are planned in the near future. Cone Health is "just a great tenant," Taft said. "They have a 10-year lease." Taft said multifamily residential communities have dominated TFV's holdings, especially in the Greenville area, and that the company is trying to diversify into different sectors and other geographical markets. "We're in the process of investing between $22 million and $25 million to try to increase the diversity of our holdings," Taft told TBJ. TFV also owns a 60,000-square-foot building at Kimel Park and South Park Shopping Center in Winston-Salem. TFV has an assortment of medical buildings as well as student apartments, single- and multifamily residential communities, and industrial and office developments throughout the Carolinas and several other states. The company, through subsidiary Taft-Mills Group, has started construction on Amberly Trace, an 80-unit affordable housing apartment community at 1029 Chapel Hill Road in Burlington. It plans to start construction on Oliver's Trace, an 88-unit affordable complex at 1134 Oliver's Crossing Circle in south Winston-Salem, in summer 2019. Taft-Mills Group is set to build an affordable housing apartment complex worth just under $11 million in Burlington. Taft-Mills Group is building a nearly $11 million affordable housing apartment complex off Chapel Hill Road, Burlington. Company President Dustin Mills said he expects to start construction on Amberly Trace Apartments in late September or early October. Construction will take about a year, and Mills said the company will start taking lease applications in the spring. Mills said the complex will have 80 units of affordable housing in four residential buildings. It also will have an exercise room, a computer center and a multi-purpose room. The company will serve as its own general contractor. 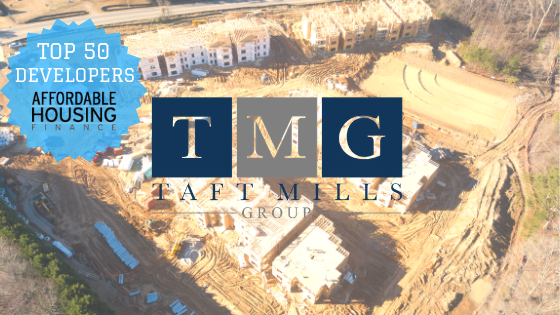 Taft-Mills is a subsidiary of Taft Family Ventures, which develops, builds and manages affordable housing in the southeast. On Friday, September, 21, the Taft Family Ventures team celebrated our Community Day event. We helped out at the Greenville VA Hospital by giving out ribbons to all the veterans and their respective families, and most importantly - thanking them for their service. We also talked to people throughout the day and cooked lunch for everyone. Furthermore, it was National POW/MIA Recognition Day, making it an extra special day for everyone involved. Recently, Taft-Mills won the Housing North Carolina Award for their Parkside Commons Senior Community (pictured above) located on Johns Hopkins Drive in Greenville. Taft-Mills Group received funding through the North Carolina Housing Finance Agency to develop 268 units of affordable housing in two separate North Carolina cities. The proposed developments will be located in Raleigh and Winston Salem and represent a combined $38 million-dollar investment in those communities. Taft-Mills is an award-winning developer and owner of affordable housing communities throughout North Carolina. In addition to their recently funded Raleigh and Winston Salem communities, they are also presently building other communities in Raleigh, Burlington and Benson. 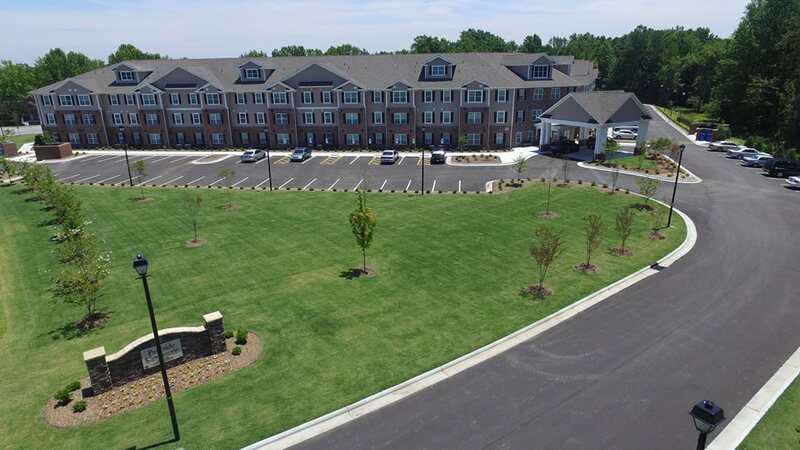 Taft Family Ventures (TFV) accepted $14.8 million in the sale of Signature Place Apartments, a 171-unit community in Greenville, N.C. Located at 410 Beasley Drive, Signature Place Apartments, spans across more than 15 acres and includes 48 one-, 84 two- and 39 three-bedroom units. Waterstone Multifamily worked on behalf of TFV and Drucker & Falk, its joint venture partner, in the transaction. 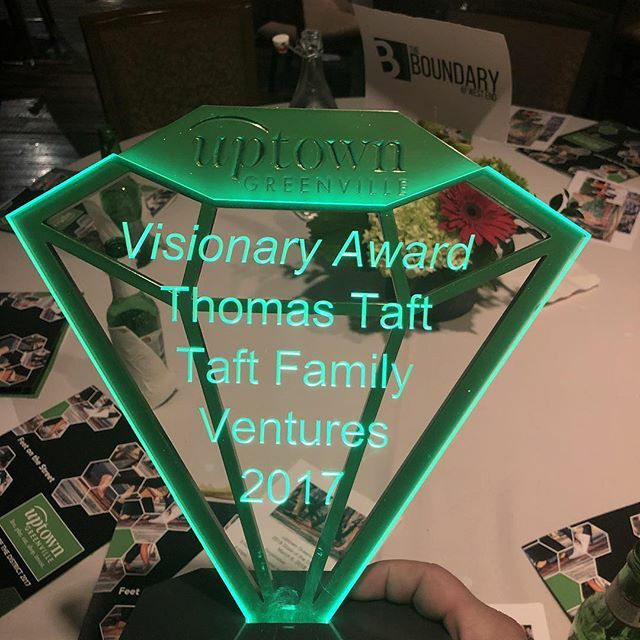 Taft Family Venture's Principal Thomas F. Taft, Jr. was honored as the recipient of Uptown Greenville's "Visionary Award" during its annual State of the District Program. The Visionary Award recognizes new and old businesses and the partners that helped make them possible. Thomas received the award for his efforts in revitalizing several properties and areas in downtown Greenville.